Recently, LBG Associates published a research study on how nonprofits view pro bono help. The genesis of the project was to understand why there is an apparent imbalance between the supply of corporate pro bono volunteers and the demand for their services. The survey asked nonprofits about all aspects of a pro bono engagement, from determining the need to evaluating the outcome. The resulting report, “Balancing Pro Bono Supply and Demand: Challenges and Solutions from the Nonprofit Point of View,” was based on the responses of more than 1,400 nonprofits. 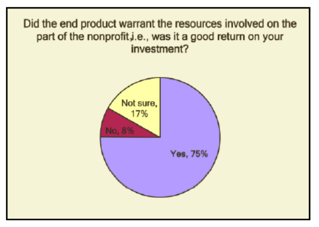 Knowing that time and resources are always scarce at nonprofits, we expected to see modest evaluation efforts at best. Instead, we were pleasantly surprised to find that 57% of respondents said that they evaluated the success of the pro bono project. The survey then dug deeper, asking what types of data the organization collected for its evaluation. Nearly 76% said they collected outcome data in order to measure the difference the project deliverable made. That was a surprising but also a gratifying result, as it is important for the growth of pro bono that nonprofits know whether it is worth the time and trouble. About 60% said they collected process data to measure how well the project was executed and managed. Forty-six percent said they collected input data, including how much staff time and money was spent in the course of the project and implementation. Evaluations answer the most important question—was there a positive change as a result of the pro bono project? Although the survey did not ask about specific evaluation results, it did ask key questions about satisfaction, which offer an indication of success or failure of the overall pro bono experience. When the respondents took stock at the end of their pro bono engagement or engagements, they felt that the experience was worthwhile in terms of the quality of the deliverable and in terms of the return on their investment of resources. These results bode well for the growth of pro bono. There are many challenges, of course, which are detailed in the full report. And there are many things corporations can do to help solve those challenges. We encourage you to explore the full report and get the big picture of how nonprofits view the challenges of pro bono engagements and the solutions they propose. 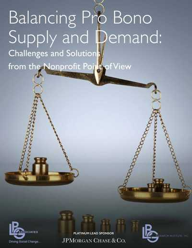 The report, “Balancing Pro Bono Supply and Demand: Challenges and Solutions from the Nonprofit Point of View,” is available for download free of charge at http://bit.ly/lbgprobono.